After a long day of watching geysers erupt, climbing volcanoes, swimming in geothermal pools, and snowmobiling on glaciers, you’ll probably have worked up an appetite. What you really want is a meal as fantastic as your day, but where to go? Here are a few suggestions of where you can go for an unforgettable eating experience in Iceland by Thora, one of our Iceland Travel Specialists. 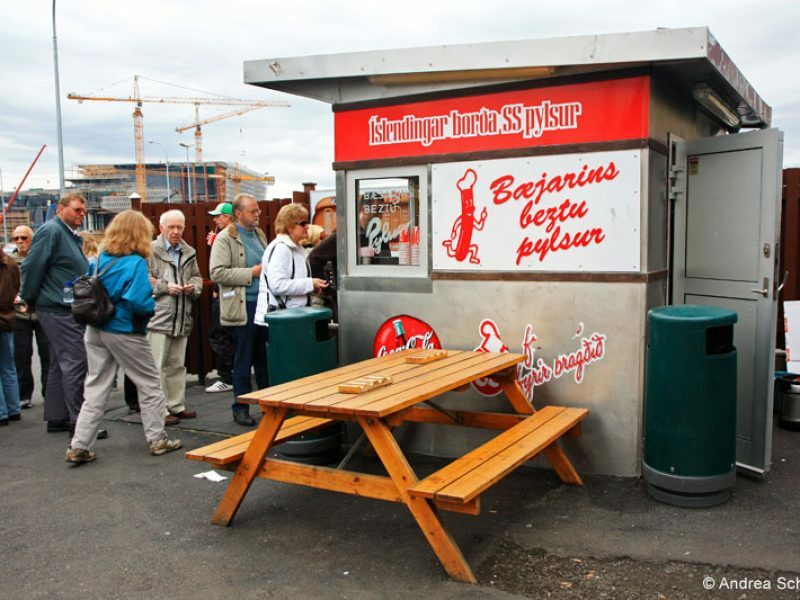 Although there are many fantastic restaurants and eateries in Reykjavik, perhaps the most famous of them all is a humble hot dog stand near the harbour. Baejarins Beztu (“The Best in Town” – pictured above) has been providing the people of Reykjavik with delicious hot snacks since 1937 – the queue outside this little booth, often snaking its way out into the street and round the corner, testifies to the general consensus that the hot dogs served here are some of the best in the world. Surrounded as it is by sea on all sides, Iceland has a long history of seafood. Vid Fjorubordid (“At the Beach”) is a famous restaurant in the tiny village of Stokkseyri on the south western coast. Small and personal, people come from far and wide for a taste of Vid Fjorubordid’s exceptional lobster dishes – and being just down the road from the village’s ghost and folk story museum, it makes for a great end to a fun day. Strangely enough for a country with a cold climate, ice cream is very popular in Iceland; on warm days (and even on days that are not so warm!) locals can be seen enjoying large cones outside the country’s various ice cream shops, and few are as popular as Brynja in the town of Akureyri up in the north of Iceland. Famous for its extremely tasty secret family recipe, this ice cream parlour in the old part of the town down by the sea is well worth a visit, particularly for families. Ask for a “bragdarefur” and choose your own fruits and sweets to be blended into your ice cream, creating your own unique personalised flavour. A cosy family run farm café in the beautiful fjord of Eyjafjordur in the north of Iceland, at Kaffi Ku (“Café Cow”) you can enjoy tasty locally baked goodies and a cup of tea or coffee from a balcony above a working cowshed. Watch the cows being milked and fed and learn about Icelandic farming; you can’t get much closer to the source of the whipped cream on your waffles and the milk in your tea! And on Saturday nights the café is opened as a pub with live music. If you want a beautiful place for a meal in the west of Iceland, you could do worse than the island of Flatey in the bay of Breidafjordur – which is full of beautiful green islands and birdlife. This tiny island community, where no cars are allowed, is framed on three sides by the mountains of the mainland so you can drink in the views while enjoying an amazing locally sourced meal at the island’s only hotel/restaurant. As there are only two ferries to and from the island per day (from Stykkisholmur on the south side or Brjanslaekur on the north side of the bay) you can either get the morning ferry to the island, leaving on the late afternoon ferry, or spend the night on the island. (Please note that Hotel Flatey is only open between the beginning of June and the end of August). The above places are not the only places in Iceland where you can enjoy a mouth-watering meal – far from it! Iceland’s lamb is world renowned, and no trip to Iceland is complete without a taste of the local fish (often cod or haddock, or freshwater trout). Even the tiniest villages will usually have a small restaurant where you can get a wonderful meal of local delicacies, and hotel restaurants are a great place for this too. If you get the opportunity, don’t miss the chance to try some Icelandic specialties such as hangikjot (tangy, smoked mutton), plokkfiskur (a stew of mashed fish and potatoes), or the classic kjotsupa (lamb and vegetable soup). For the more adventurous looking to try something truly unique, there is also the thoroughly traditional hardfiskur (dried fish), svid (burnt sheep’s head), and hakarl (fermented shark meat) – an acquired taste perhaps, but definitely an experience!